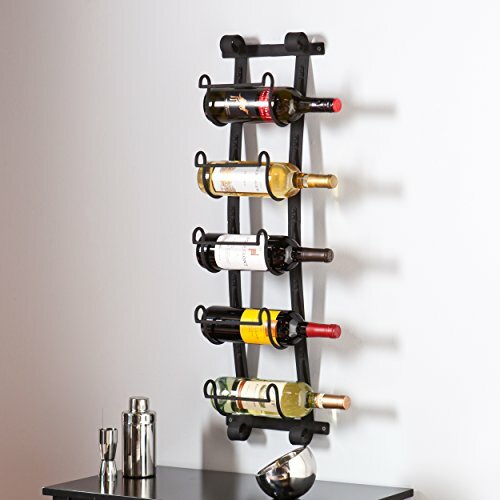 Make use of spare wall space while showing off your favorite bottles with this wall mount wine rack. In a natural wrought iron finish, the open metal design draws attention to your most coveted wine labels for a truly one of a kind artwork. Five bottles are displayed laterally on individual holders for convenient access and display. This functional art is a perfect gift for wine lovers! Slight color variations may occur. This functional, decorative wall sculpture transforms wine storage into wall art. Includes 4 attached keyhole hangers for easy installation. Dimensions include: Overall: 10.25" W x 8.25" D x 33.5" H. This one-of-a-kind item approximately weighs 9 pounds and can support up to 5 pounds (per bottle holder). Only quality materials and manufacturing will do. Product materials include: plate metal, round metal tube, square metal tube. Assembly: No assembly required; ready to hang. Made in China. Materials: plate metal, round metal tube, square metal tube; Supports up to: 5 lb. (per bottle holder); Approx. weight: 9 lb. If you have any questions about this product by SEI, contact us by completing and submitting the form below. If you are looking for a specif part number, please include it with your message.